I commute to work by bike, and in the late fall and winter, it is often after sunset when I go home. The bike trail that connects the office in which I work to my apartment is only illuminated about 3/4 of the 1.5 mile trip. 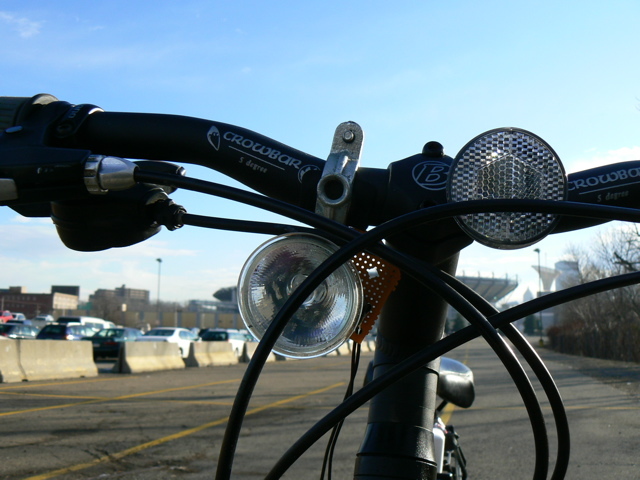 A bright front headlight is useful for avoiding obstacles (potholes, tree branches, goose droppings) and also alerting oncoming traffic. I forgo the rear blinker because I am not competing for space with cars and I make it a game to see how quickly I can get home so I never get passed by other cyclists. Lamp: Sylvania ESX 12V MR16 20 Watt bulb. The ESX designates this as a narrow beam spot light (using a built in reflector). 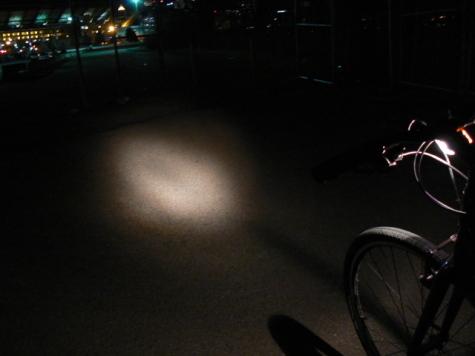 This is perfect for maximally illuminating just the part of the pavement that the bike will be travelling over. 20 watts means a current draw of 1.67 amps @12v. These are used for interior accent lighting, but have a glass front panel, which makes them weather resistant even if they're not advertised as such. Cost: about $10 for 3 at the hardware store. 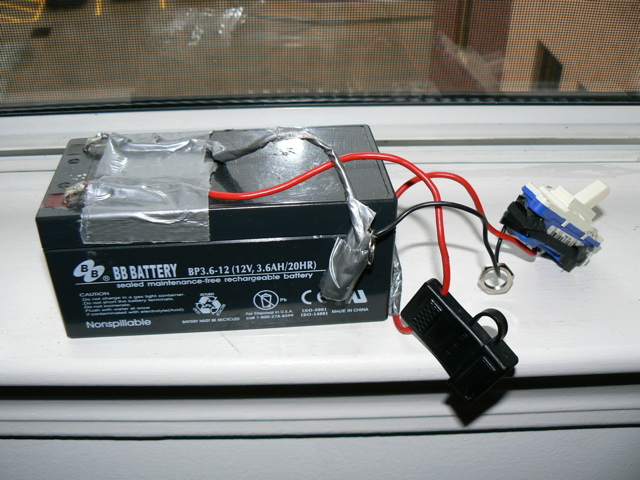 Battery: 12V 3.6Ah Sealed Lead Acid Battery. I bought it here: http://www.zbattery.com/bp3-12.html. This gives theoretically just over 2 hours of battery life for a full charge; perfect for a week's worth of 10-15 minute jaunts home. The spec sheet lists storage and discharge tolerances of down to -4 degrees F. That's perfect because if it is that cold, I'm not riding my bike to work. I also bought the cheapo charger from the zbattery site. Cost: about $30 for battery, charger, shipping. Misc stuff: wire, connectors, a small circuit board, soldering equipment, a clamp, duct tape, bungee with hooks, a fuse assembly, a wall light switch, and a sock with a hole in it. Here is the battery assembly. The switch is a 50 cent wall switch, the black thing is a housing for a removable fast reacting automotive 20 amp fuse. The duct tape mess near the fuse is the connector to the rest of the setup. It is covered in duct tape because the entire assembly is conductive. Hillarity ensued the morning that the socket, shown here connected to the black terminal of the battery, touched the red terminal, bypassing the fuse on the red wire. This caused a short that ended only when the black wire MELTED the solder from the battery, disconnecting the short. This is a good example of why a fuse is useful even if it only protects from disaster scenarios other than this one! 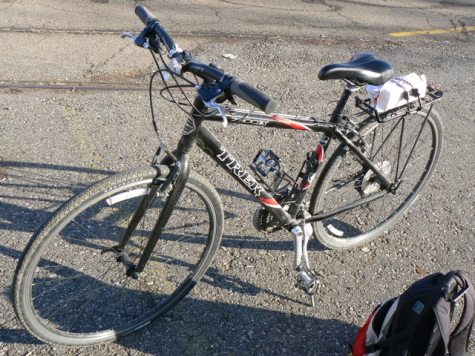 A single bungee cord attaches the battery to the rear rack on my bike. 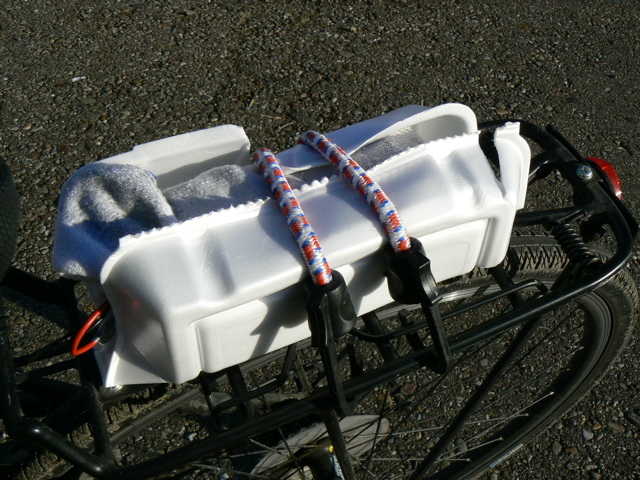 Shown with optional equipment: mud splash guard made from the top of a styrofoam lunch container. The headlight is soldered to a small circuit board that is unceremoniously clamped to my handlebars. The small hole in the upper left of the board is from my initial design which included two clamps for security but I have found that one clamp is sufficient. 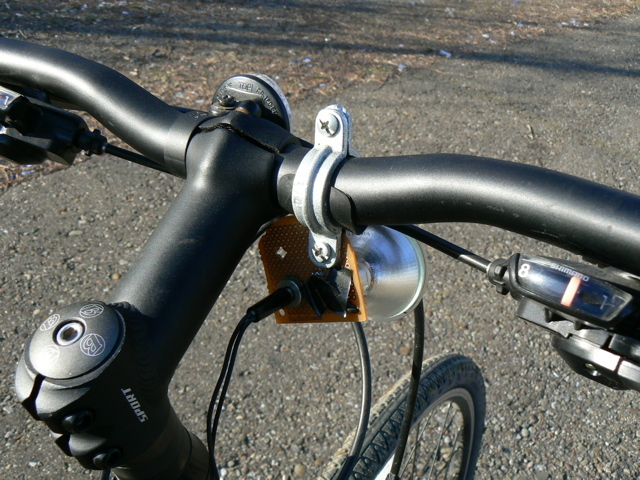 The wire plugs into a socket bolted on the circuit board and wraps around the tube of the bike frame until it reaches the battery in the back. The front view of the light assembly. The beam is trivially obscured by the brake cable passing in front of it. I'm not typically riding in rain or snow since I wear my work clothes while riding but occasionally it is unavoidable on the trip home. 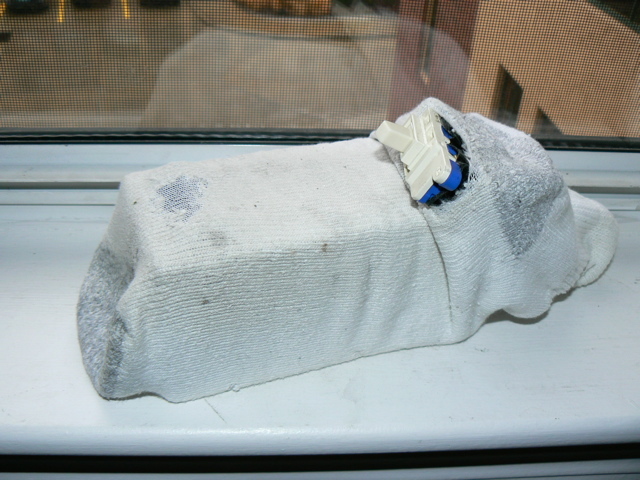 In this case, I'll pack extra layers of styrofoam around the battery to keep it dry. The headlight assembly has required no maintinence in the 10 or so months that I have had it mounted regardless of the weather. I have had no trouble with the setup and it has helped me navigate through some post-wind storm debris during the foilage-darkened parts of my ride home. Success! The light is quite bright. There are some buildings and a parking lot in the distance as a luminosity reference point. The light system is not intrusive. I even have access to both water bottle cages.